Thanks for taking a look at my online courses. 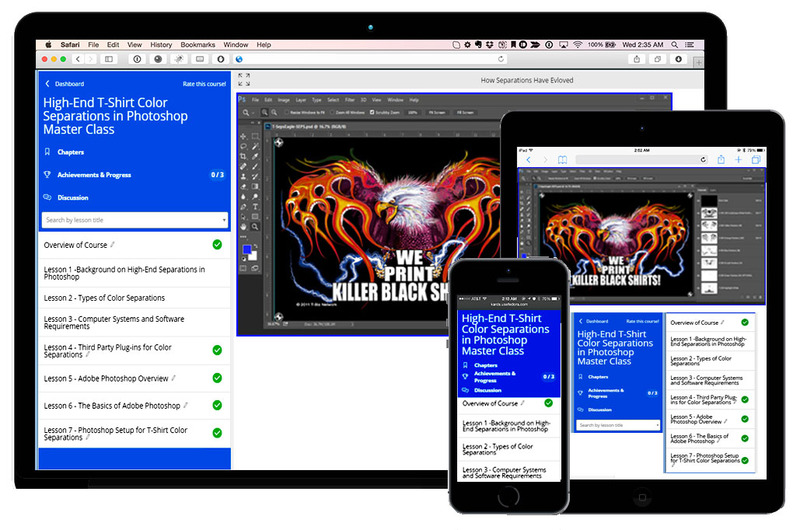 These Master Classes have evolved from years of teaching people directly at trade shows, in hands-on classes at my popular Printers Boot Camps and in one-on-one sessions consulting printers large and small around the world. But, not a week goes by that we don't get emails from printers asking if we do the classes as online training because they just can't find time in their schedule to leave the shop. We also hear from a lot of printers that they tried to learn through YouTube videos and while that is a good start - they felt they did not know if the information was correct or the credentials of the instructor. And, it was hard for them to refer back to a specific section or topic. Our courses are designed to teach you step-by-step at your own pace without ever leaving your home or shop. Each course is broken down into short segments of five to eight minutes where you can easily go back and refresh at any time exactly what you want to review. You also get small mini-manuals as a reference for key points and important concepts. Plus, it is like having me watching over your shoulder. Every class has opportunities to submit sample work for evalation and critique, and you can email me directly with questions. You can also discuss problems or questions with your fellow peer students on our Discussion Forums. We have designed all of our courses and the video content to be viewable on a normal desktop computer and tablets and smart phones. Remember, you are in good hands with me. 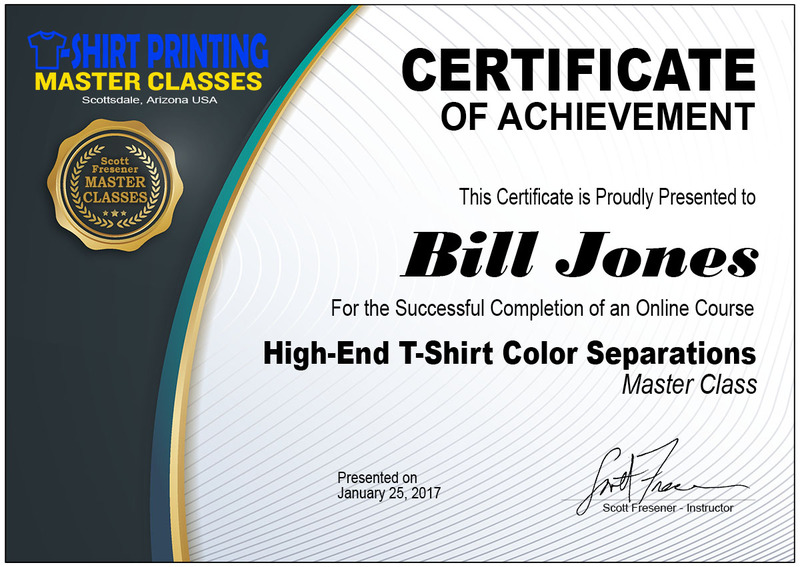 I have taught the world how to print T-Shirts, all about Computer Graphics and Color Separations and more. You get consistent step-by-step training from a seasoned veteran who knows the importance of making sure you learn the correct way. Refer back to a course and review for up to TWO YEARS. You get to keep the downloaded Mini-Manuals and other training aids. The videos are available for two years from the date you register. The payoff to all of my Master Classes is that you will graduate with confidence and skills that you can put right to use. Whether you are an employee or an owner/operator, you will benefit from these classes. Once you complete a class you will receive a Certificate of Achievement that you can proudly hang in your shop or office and include in your resume as part of your industry training. Signup today and improve your skills and industry education. If you want to learn more about me here is a complete Bio at my main website www.T-BizNetwork.com.